Make learning to tell the time a fun experience with this playful Tikkers purple unicorn silicone strap watch. 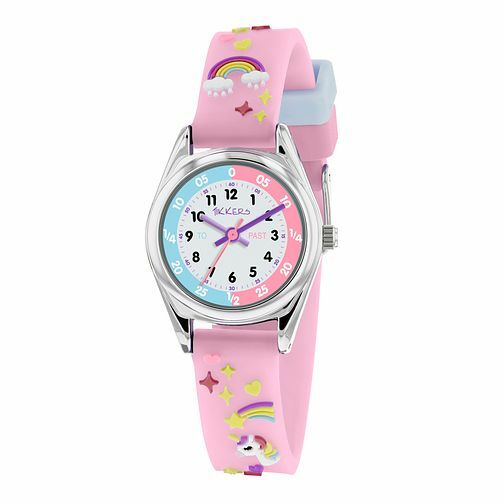 Featuring a comfortable silicone strap, adorned with playful unicorn and rainbow images. The dial is split in to two handy sections, teaching children the correct terminology for telling the time. Your little one will not want to take off this stylish watch. Tikkers Purple Unicorn Silicone Strap Time Teacher Watch is rated 5.0 out of 5 by 6. Rated 5 out of 5 by Anonymous from Fantastic Kids’ Watch As a mother and teaching assistant, I love this watch! It has handy additional minute markers: 15, 30 and 45 instead of just 3, 6 and 9; it really helps develop time-telling skills. Oh and it looks lovely, too! Quality seems great so far, but daughter has only had it for a month.